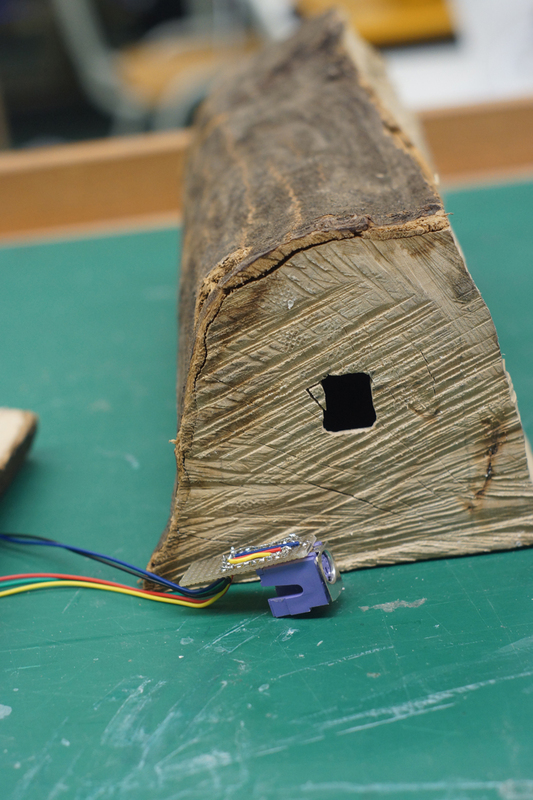 an interface between “natural” and digital spaces. To invent an interaction that goes beyond the common WIMP-Metaphors. 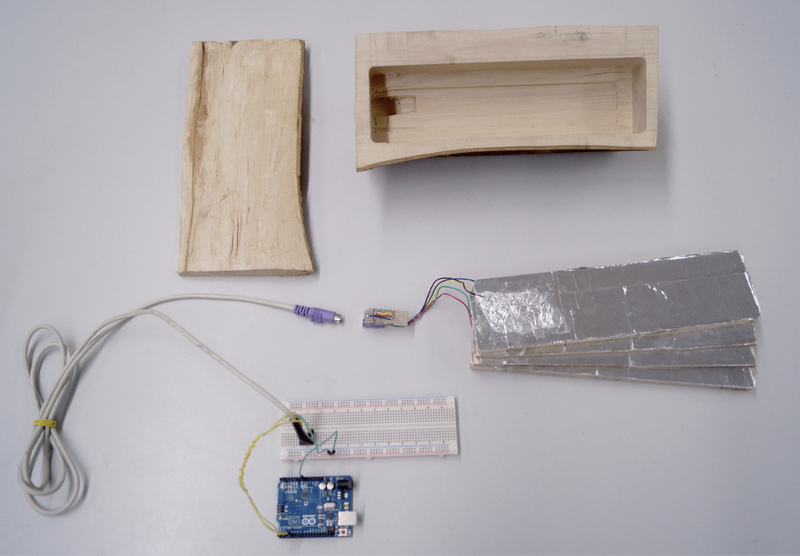 the group of students decided to control not more than three basic elements: a bulb, a fan and/or sound. 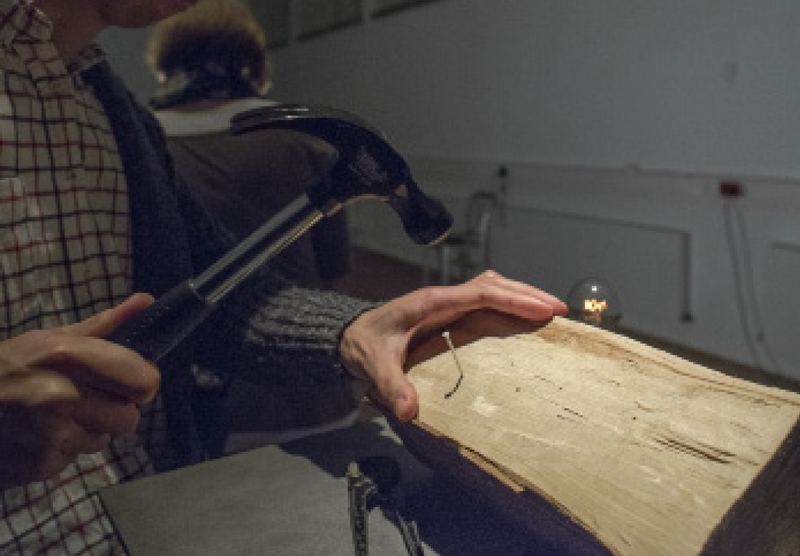 If the user pulls the nail out of the wood again, what required quite some power, he extinguished the lamp‘s light and the interaction can take place again. By choosing the hammer and nail metaphor, the relationship between man and machine interface a loud, powerful, effort-requiered and martial interaction is created. The user dictates the lamp in which light level it has to shine; moreover, the sinking of the nail in wood on a strong association with traditions, crafts and strength. 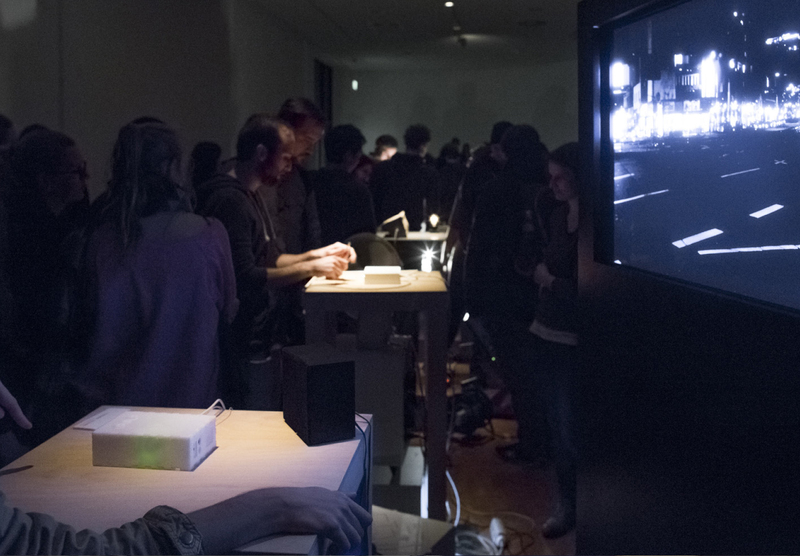 The dissonance between art and craft is addressed by the use of this iconic tool and serves as an experimental bridge between digital and „real“ spaces. 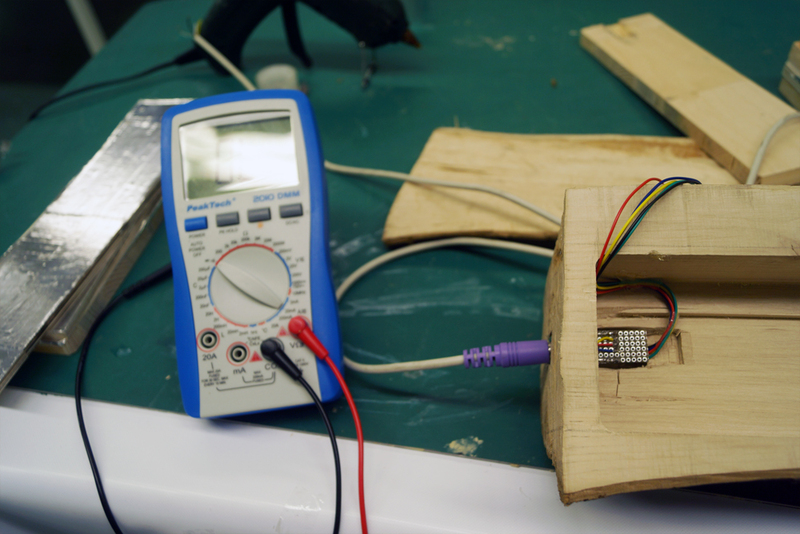 By using a band saw a 3 cm thick slice of wood was cut off the area of the wooden block. 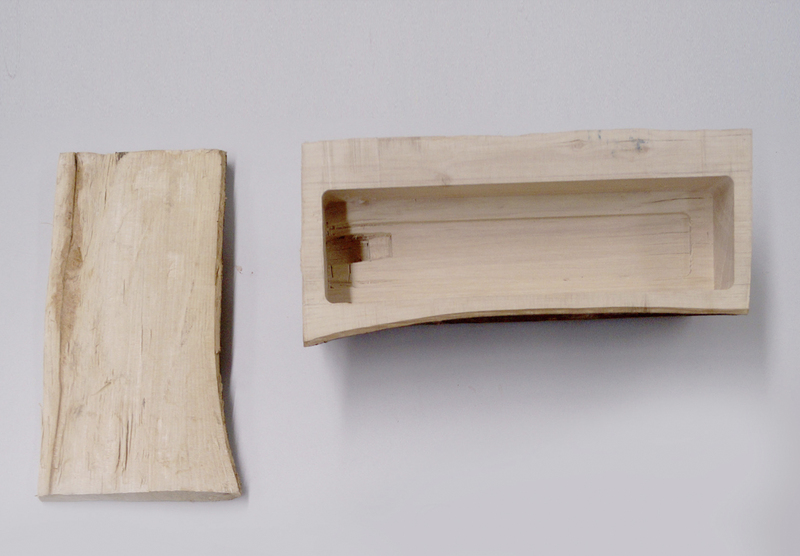 This peace was reattached later, to give the illusion of a unprepared peace of wood. 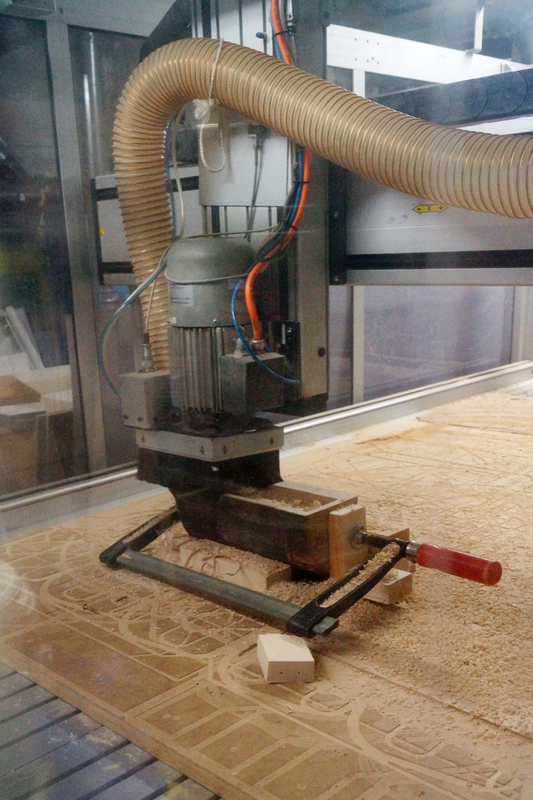 The area underneath was hollowed out with the CNC milling machine. 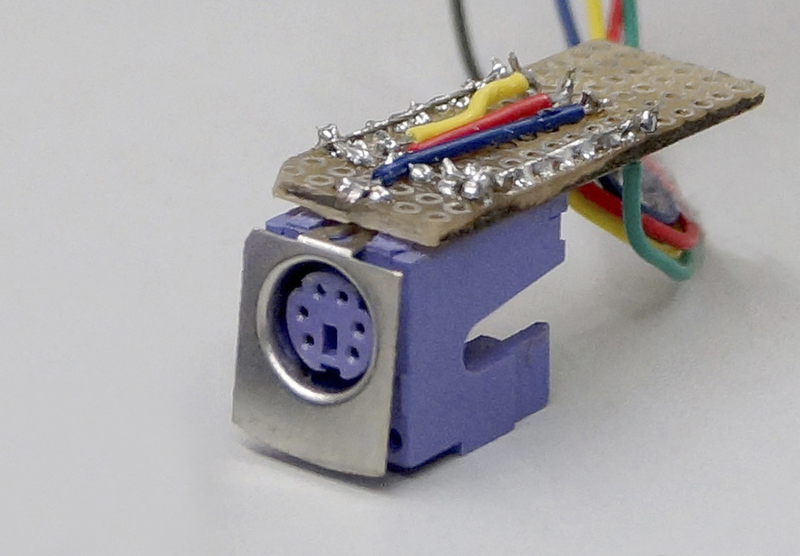 I manually drilled a hole that provides enough space for implementing a PS/2 Plug and a small perfboard. 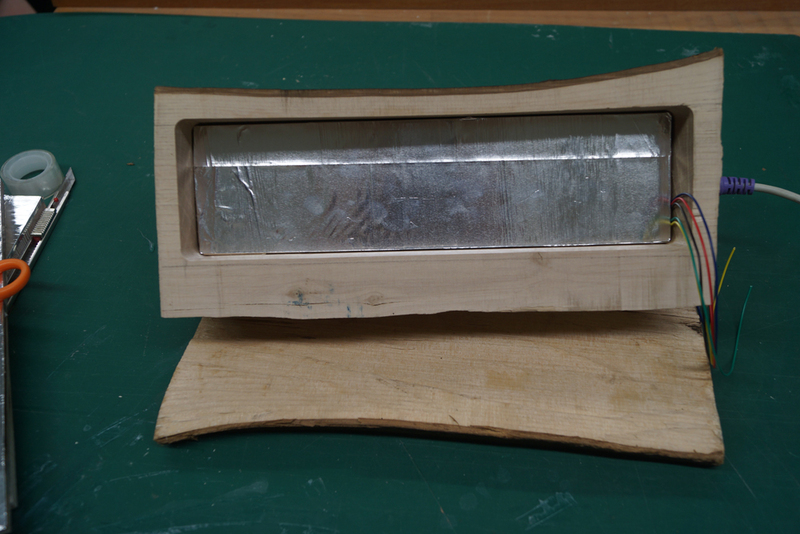 The 3 cm thick cover was glued back on for staging the object during the exhibition. 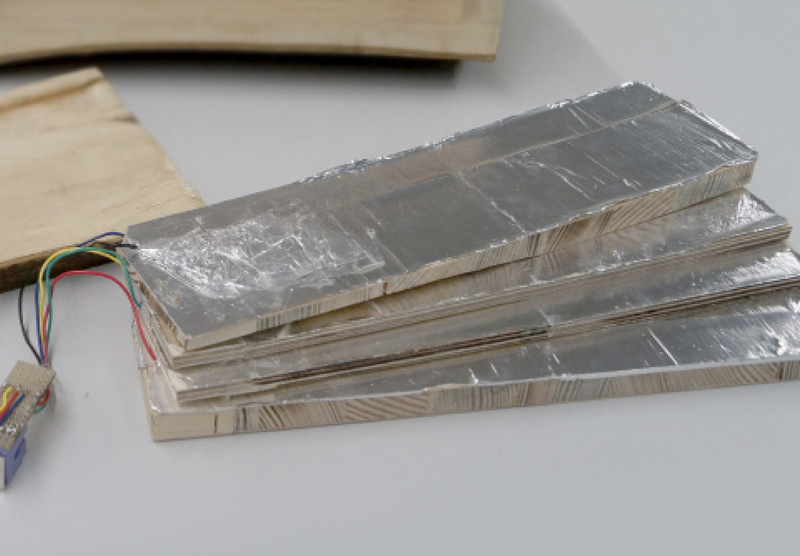 The inside is filled with stapeled wooden planks, that have a conductive upper surface by using aluminium tape. 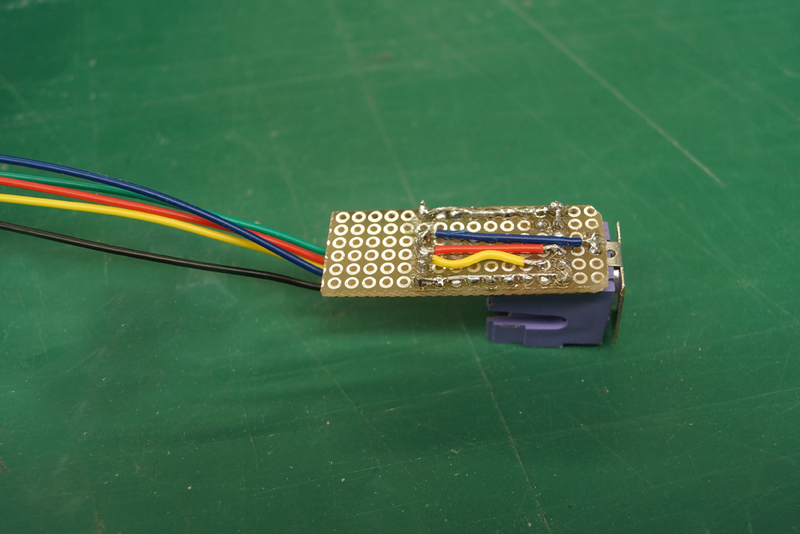 Eache plank has a cable attached to the conductive area, that is connected to toe PS/2 plug which leads to a Arduino board. 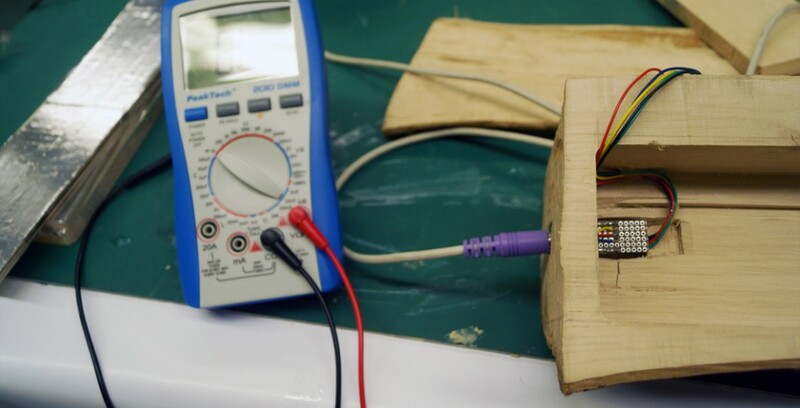 If a nail penetrates two layers of wood a circuit is closed . 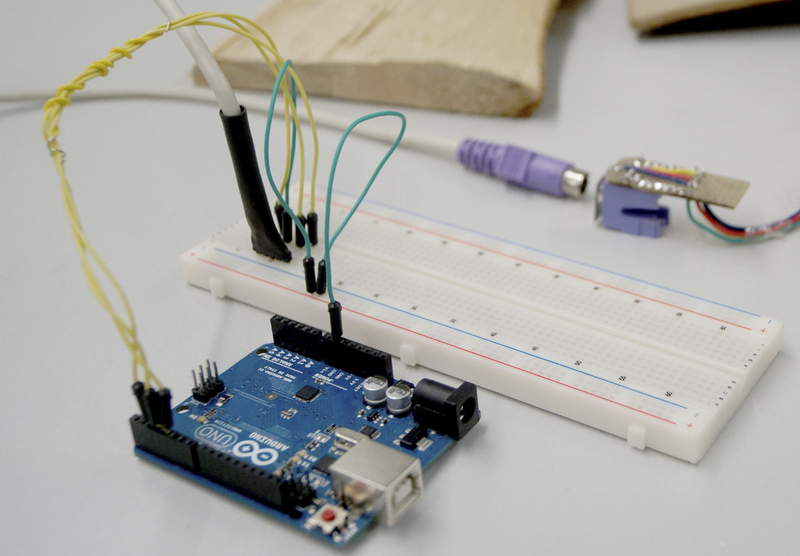 In this case the programmed arduino scriped sends out a signal to let a certain amound of electricity to the lamp, wich causes a change in the brightness of it‘s light. For the traditional frieday presentation at KISD we did an exhibition. Lumbervolt was screwed on an anthracite MDF board. To insure an intuitive useage hammer and nail are placed at the front area of the table. The bulb occurs in the background and starts to cause the attention of the hammering person for the the first time when it lights up the first time. Because hammering is experienced as an interessting action, a lot of participants wanted to have a try. The fact that I did not have to explain how to use it proofed my plan of giving an intuitive Interaction. 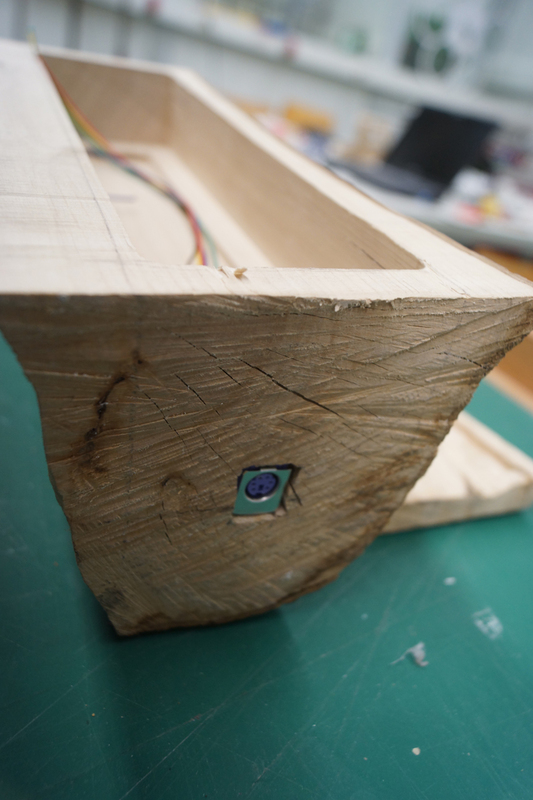 The technical realization of the idea proved to be exciting and helped me reflecting on the integration of common interaction tools into digital devices. In particular, the observation of the exhibition visitors and, by the choice of materials and the light setting, scored enthusiasm for this type of interface were enlightening for me. 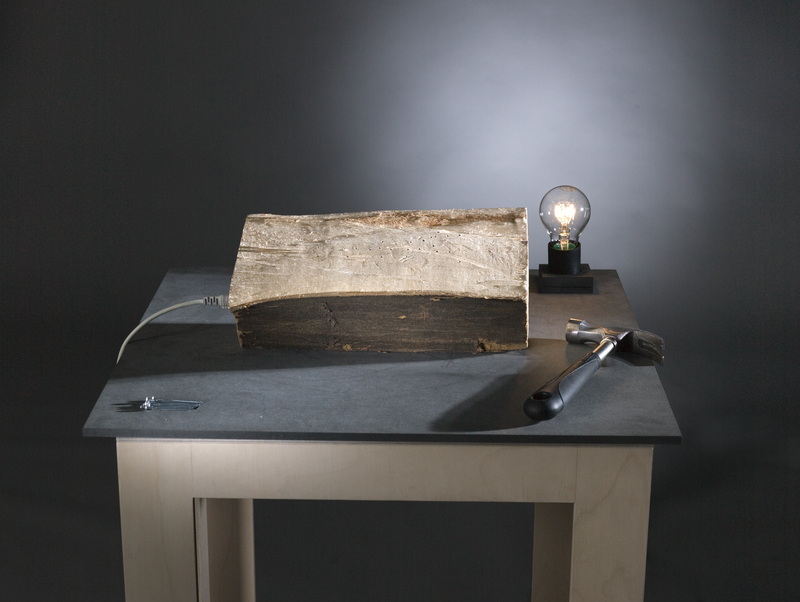 It would be interesting in the future, when a longer periode of time is given, a lamp, with a body, that is made of wood, and in which one could directly hammer a nail.